A Humorous Quirky Laugh out loud Romantic Comedy of errors that is based on a true story, which finds Skye, an ordinary bachelor getting talked in to wearing a dress by his girlfriend for Halloween. Skye is told by Sandy that all her girlfriends husbands dress in drag and the wives and husbands have a girl’s night out. A series of humorously funny mishaps unfold and as the evening progresses, things become hilariously out of control. The misadventures of Skye and Sandy and their quirky romance will leave you crazy glued to the book to find out what will happen next. If you only read one book this year, this is it! -It is a really hilarious story, well- executed. I had just finished my first book called “My Life without a Parachute” which was a book based on truth so it was easy to write. It contained 35 short stories. 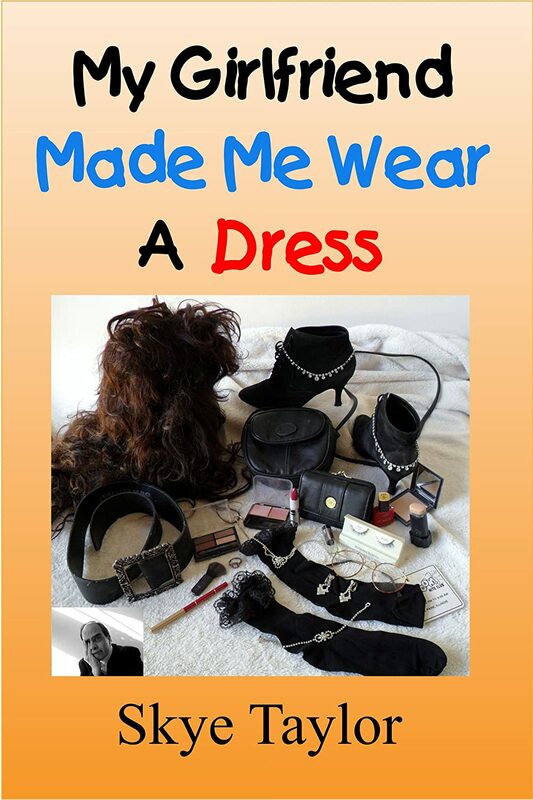 My newest book, “My Girlfriend Made Me wear a Dress” is also a very hilarious book based on truth. If you only read one of the two, this would be the one. Skye Taylor is a life achiever wearing many hats throughout his life. Skye is a world collected Artist and has won many awards for his paintings. His YouTube artist videos have over 1 million views and over 5,000 subscribers and growing. Skye has won awards in Music and for his Animation work as well. Skye helped produce and direct a Dog Show for cable television in the 80’s as well as operate the camera. Skye retired in his 20’s from a successful import Toy business he started. Skye’s love of comedy and his enjoyment for telling stories have come to fruition in his first non-fiction writing; “My Life without a Parachute”. A book based on the true funny, sad, bizarre and spooky stories of his life. Skye plans to continue writing more books as he works to complete his bucket list. Have you read this book or another by this author? If you have, please scroll past the book sample and tell us about it in the comments!